Last month was Fire Prevention Month, and we shared tips on how to reduce the chance of a home fire throughout the month as well as through a blog post on a cooking-related fire. While this is another post on a cooking-related fire, I felt it was important to share. Read on and you’ll figure out why. A customer was cooking something on the stove, using oil, and turned her back for just a moment, as we’ve all done. When she turned back around it was on fire, so she called to her husband to help. His instinct was to take the pan and get it out of the house. As he grabbed the handle, his wife accidentally got in his way. As a result, he stumbled and hot grease flew out of the pan, hitting them both, and causing the couple to both have third degree burns. 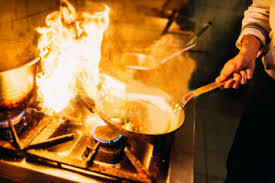 Keep a fire extinguisher, in working order, in your kitchen at all times. When cooking, always have the lid that goes with the pan sitting nearby so you can use it to smother out a fire. If you don’t have a fire extinguisher or a lid, you could try to use baking soda to put out the fire. Never, ever take your eyes off, turn your back, or leave the room when cooking something. Never pick up or move a pan that is on fire. Don’t try to be a hero. Fires can get out of control quickly. If you feel a moment’s hesitation on what you should do – then just get out safely and call 911.